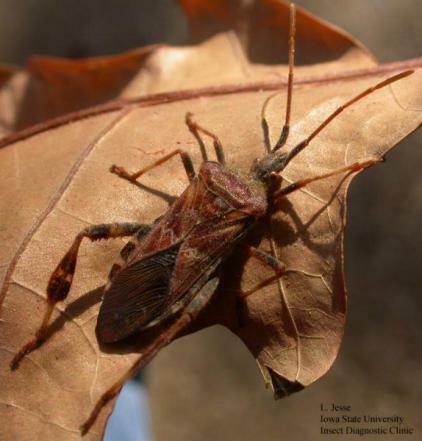 The pine seed bug, also called the Western conifer seed bug, (Leptoglossus occidentalis) is a common household accidental invader found inside Iowa homes during the fall, winter and spring. This harmless nuisance most closely resembles the squash bug found on pumpkin and squash foliage during the summer. The pine seed bug is in a small group of insects called the leaffooted bugs. This name refers to the flat, leaf-like expansions of the hind legs. Pine seed bug is a true bug (Order Hemiptera, Family Coreidae). Consistent with all members of this order the insect has a simple life cycle (egg, nymph, adult) and sucking mouthparts. The pine seed bug is about 1 inch long, elongate in shape and dull reddish brown in color. It appears pointed at both ends; the antennae are almost the length of the body and are obvious in living or fresh specimens. A faint, white zigzag line is more or less noticeable across the center of the back (depending on individual). Pine seed bug nymphs and adults spend the summer on pine and Douglas-fir trees where they use their piercing-sucking mouthparts to feed on sap from green cones and twigs. This sap feeding is of no consequence to otherwise healthy trees. Cones may be damaged causing seed to fail to develop (of no consequence to most Iowans, though pine seed producers of the Pacific Northwest must control this pest to prevent low seed yield). The pine seed bug is a typical accidental invader, similar to the better known attic flies, Asian lady beetle and boxelder bug. The adults wander into houses by mistake in the fall of the year. They are attracted to the exposed south sides of houses where they bask in the warmth of the late summer sunlight. After sunset, they crawl into wall voids and attics through cracks and gaps in the siding, foundation and eaves, or around windows. Like other invaders, they do not bite, sting, feed, carry diseases or otherwise cause harm to people, pets, the house or its contents. They cannot reproduce inside the house, as egg laying and development are restricted to the host plants during the summer months. Control is the same as for other accidental invaders. Seal cracks and gaps to prevent entry. Pine seed bugs already indoors need only be picked or swept up and discarded as they appear. Spraying the house in winter or spring is of little benefit.